WEDNESDAY, July 11, 2018 (HealthDay News) -- Here's yet another reason to get your blood pressure under control: High blood pressure later in life may contribute to blood vessel blockages and tangles linked to Alzheimer's disease, new research suggests. Tracking nearly 1,300 older people until they died, scientists found markedly higher risks of one or more brain lesions among those with high systolic blood pressure readings. These lesions were dominated by so-called "infarcts" -- areas of dead tissue prompted by blood supply blockages that can trigger strokes. Normal blood pressure is defined as 120/80 mm/Hg or lower. The top number is known as systolic blood pressure (pressure in vessels during heartbeats), while the lower number is diastolic blood pressure (pressure between beats). Late last year, the American College of Cardiology and American Heart Association changed blood pressure recommendations, defining high blood pressure as 130/80 mm/Hg or higher. "We've known for many decades that higher blood pressure, especially younger in life, is related to strokes. But we know a lot less regarding cerebrovascular disease and wanted to examine the question of blood pressure later in life," said study author Dr. Zoe Arvanitakis. She's medical director of the Rush Memory Clinic in Chicago. "I think this information is of great value to researchers who study brain changes in aging," she added, "and certainly points to the need for a lot more research to be done." Arvanitakis and her team followed nearly 1,300 people until their death, which occurred at an average age of nearly 89. Two-thirds of the participants, who were mostly women, had a history of high blood pressure, and 87 percent took blood pressure medication. Using autopsy results after participants' deaths, the researchers learned that 48 percent had one or more brain infarct lesions. The risk of lesions was higher in those with higher average systolic blood pressure readings over the years. For example, for someone with an average systolic blood pressure of 147 mm/Hg compared to 134 mm/Hg, the odds of brain lesions increased 46 percent. A smaller but still notable increased risk of brain lesions was found in those with elevated diastolic blood pressure as well. Looking for signs of Alzheimer's disease in autopsied brains, the researchers also saw an association between higher systolic blood pressure in the years before death and higher amounts of tangles -- knots of brain cells signifying the presence of the condition. However, amyloid plaques, which also characterize an Alzheimer's-affected brain, weren't linked to blood pressure in the research. Arvanitakis said more studies are needed. Dr. Ajay Misra is chairman of neurosciences at NYU Winthrop Hospital in Mineola, N.Y. 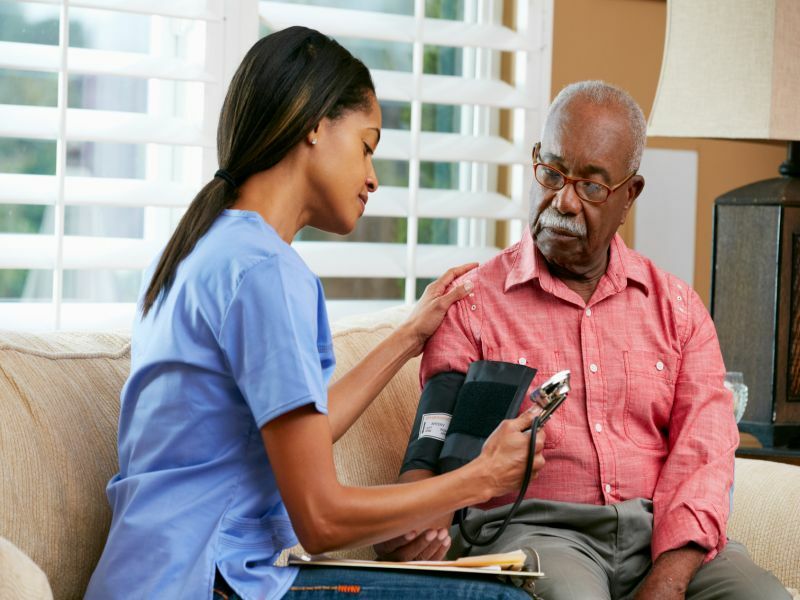 He described the study as "very important" and said it should prompt crucial dialogue about how to best manage blood pressure in older adults. "A lot of good information came out, but there are more questions than answers," said Misra, who wasn't involved in the new research. "This study was done to provoke that sort of questioning." Misra noted the study found that rapidly decreasing blood pressure in older adults actually increased stroke risks. A potential reason for that, he said, is that arteries become less elastic as we age, so slightly higher blood pressure is necessary to keep blood flowing adequately. "This acts as a reminder that you cannot just go and publish that one set of blood pressure guidelines is good for all," he added. "I think it will either be age-specific about how blood pressure should be maintained, or there should be some disease- or circumstance-specific guidelines." The study was published online July 11 in the journal Neurology.